We took a look at dozens of home gyms on the market and came up with this list of ones that we think are the best. These home gyms are the best in regard to quality, but also, price. The Bowflex is the first option we will be looking at, coming in at just under the $500 mark. It’s a 144 lb. home gym set that requires around 100” of space horizontally to set up. Set-up itself isn’t that difficult, as two people can get it done in under an hour and a half providing you follow the handy instruction manual featured. When you do, you will have a home gym that offers over twenty-five exercises. Most of the exercises are strength building and allow you to target just about every muscle group. However, one of the nice features of this gym is that it also allows for aerobic rowing exercises. Given how expensive a decent rowing machine can be, this is very much an advantage in the Bowflex’s favor. The bench itself allows for some adjustment, primarily to allow for the rowing features, but the cable pulley positions allow you to adjust the height and angle of the pulleys as well. Besides opening up a range of workout options, this also makes it much easier to find the correct form for every exercise which is crucial. What’s more, the adjustable tension provides some room for progression, so you can keep adding resistance and growing your workout routine over time. However, rather than using weight stacks, this machine makes use of Bowflex power rods. They operate in much the same way, with the user able to attach the cables to multiple power rods depending on how much weight they want to work against. There’s over 200 lbs. of power rods to work with according to the manufacturers, but we found that you could only work up to about 100 lbs. of weight resistance in reality. That still allows for a lot of progression and growth, but not quite as much as some other home gyms. The Bowflex offers a superior variety of exercise options, so you may not need much more in your home gym space, but if you do, the handy folding bench feature is well worth the cost. This helps you quickly minimize how much room the home gym takes up. Whether you want extra space for more equipment, to do other exercises like aerobics or squats, or you simply don’t have the room to make space for a full home gym all of the time, that’s a feature worth some serious consideration. Another handy little feature is the media rack. More and more people work out to music, podcasts, or even movies and this dock has space to store digital devices like smartphones and tablets so that it’s easier than ever. For serious bodybuilders, weightlifters, and other strength competitors, the amount of weight resistance provided by the power rods might not be enough. However, for those looking to build and tone all their muscle groups, the Bowflex works like a dream. It has tons of low impact exercise options so it’s good for those who might have sustained injuries in the past, too. There are a few downsides, like the fact the wrenches included for assembly aren’t much use at all and that adjusting the bench so often for different exercises can be tedious. There might some concerns about the overall build quality as it can feel quite thin and light in parts, too. Overall, however, it’s a great machine for working a wide range of muscle groups. Our second option comes with a slightly lower price point, averaging closer to $400. However, overall build quality is not a concern at that price point. As the name suggests, this home gym comes with a vinyl coated steel tube frame. It offers up to a total weight resistance of 150 lbs., meaning that there’s plenty of room for growth with the weight adjustment. 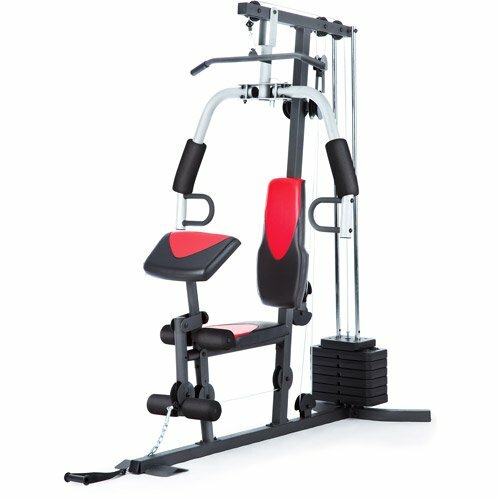 Weight adjustment works like most home gyms, contrary to the Bowflex, with a weight pin that’s set in different positions to add or reduce weight. There’s more weight resistance to work with than the Bowflex, so it might be a better option for those who are looking for real strength training. Assembly is a little more difficult, however, taking around three hours to set up, and some users have noted trouble following the instructions, which could perhaps use a little more text to make setup clearer. Weighing at 280 lbs. and measuring at 68 x 79 x 36 inches, you might need a little help getting it in position, however. Once it’s set up, you have access to the following: a press arm that can set for both vertical butterfly and chest presses, double pulley stations allowing for pull-ups, pullovers, pulldowns and pulley rows, a leg developer, and a reacher curl bicep pad. It might not have quite the range of exercises available as the Bowflex does, but it comes with enough to help you get your full body workout in. There’s some level of adjustability to help you improve your form and avoid the risk of injury. The adjustable pivot point on the leg developer is particularly helpful for avoiding those all-too-common leg joint injuries and the curl bicep pad is just as adjustable for different workouts and positions. The machine doesn’t take up a lot of space, either, so it will be a perfect fit for most homes even though it doesn’t have very many options to fold it or otherwise reduce its footprint. One issue that is worryingly common is that many users have complained about the fact that the home gym can come with missing or damaged pieces. There is little trouble getting replacements from Marcy, but it’s worth noting. Furthermore, the tools included for assembly aren’t all that effective, so you’re wise to use your own Allen key and crescent wrench. 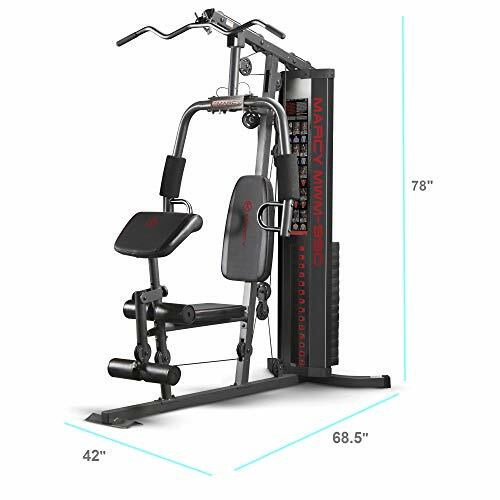 Overall, however, this is a highly sturdy machine with high-quality cables that allows for a full-body workout at a very attractive price point. It’s not difficult to recommend the Marcy Multifunction Home Gym for those who are looking for real intermediate to heavy weight exercises. Lastly, we’re going to look at the cheapest option on the menu (at least as far as we are looking). The Weider Home Gym comes in at just over $200 on average, making it less than half the price of the Bowflex. What do you get at that price-point? A surprisingly varied workout, with six workout stations, for one. This home gym measures at 46 x 76 x 37, making it just as compact as the Marcy and it weighs at 300 lbs. While the frame is strong, however, it should be noted that it can feel a little unstable. What’s more, setup is a lot more challenging than the other two machines reviewed. The instructions are very poorly written, meaning that assembly can genuinely be something of a puzzle and, even when you get it right, there are some pieces that look like they don’t fit as well as they should. What’s more, the cables are packaged very haphazardly, so simply finding the right cable for the right place can be a real chore. With some of the major concerns out of the way, let’s take a closer look at the workouts. It comes with a high pulley, chest press, chest fly, leg developer, preacher curl, and low pulley station. That’s an impressive range of exercises available, but without the adjustability of the Marcy, it is a little more limited in its options. It’s also limited by the fact that there is no height the machine at all. If you’re smaller than average or taller than average, you should be careful about this home gym as it could lead to injury. For those who fit the position perfectly, however, it offers a decent range of exercises. It also offers weight resistance up to 214 lbs., or at least that is what is promoted. However, the weight stacks have no indication of how much weight you’re actually lifting, so you need to rely on intuition and simply counting the stacks to measure progression, which is a little imprecise for serious bodybuilders. Most of the workouts feel very smooth, too, with a few exceptions. The bar on the leg developer is surprisingly small, meaning that only those with a narrow stance are going to be able to use it effectively without some trouble. The foam pads on the bar tend to shift during workouts as well, which can be annoying to say the least. Otherwise, however, there are few issues so long as you have the proportions to fit the equipment. Overall, it’s a highly affordable budget gym that offers a decent range of workouts effectively. However, if you’re not of average size or you don’t want to deal with the hassle of a very long, frustrating assembly, then you might want to look elsewhere. It’s good at what it does, it’s just a little limited and, unfortunately, feels a little cheap in comparison to the other machines. Otherwise, it’s good for a first home gym machine. Let’s look at a few of the factors that can separate the best home gyms from the average ones. These are features you should keep an eye out for not only in the following reviews but any perusal through the market you might want to take on your own. Number of workouts: You want a home gym that allows you to work out as many of your muscle groups as possible without the need to purchase more equipment. Weight stack options: Most strength building exercises rely on weight stacks. Besides the quality of those weight stacks, you want to look at how much range and adjustability they offer. A home gym with more adjustable weight stacks means you can more easily progress your workouts over time. Posture/position adjustment: Correct form is crucial when working out if you don’t want to injure yourself. That’s why you should look for home gyms that allow you to adjust height and position. Some home gyms use only static seats that can be adjusted to different heights. Build quality: It can be hard to define this on your own, but it’s a good idea to look at the reviews from those who have seen a lot of use out of their home gym. Does the frame hold its shape after repeated use? Do the pulleys and cables show any wear and tear over time? Choosing the right home gym for your money is all about identifying your needs, first and foremost. From the three reviewed, however, we recommend the Marcy Multifunction Home Gym. 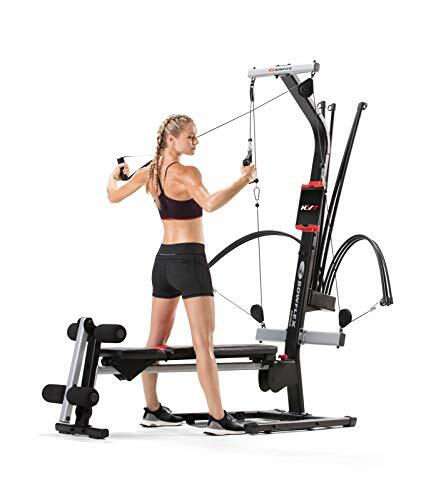 The Bowflex is a great machine in its own right and offers a little more variety, but the small profile of the Marcy and the more traditional full-body workout at the cheaper price point make it a very decent proposition. Copyright © 2019 SportAndFitnessMagazine.com. All rights reserved.